It’s not cheap to fly, and it’s definitely not cheap to fly out a whole seven piece band from New Zealand. This should say something about the promoter’s faith in Fat Freddy’s Drop, the Kiwi jazz, dub, reggae, and soul band that is making its first tour to the US. Though the group formed in the early 90s, they’ve just released their second album, Dr. Boondigga and The Big BW. While many in the states still haven’t heard of the group, their fame in Europe (BBC called the band “New Zealand’s most critically acclaimed band since The Clean”), Australia, and New Zealand (their last album sold over a 100,000 copies) is just waiting to spread through the US. SFCritic spoke with Toby Laing (trumpeter) before their trip. SFCritic (SFC): What are you most excited to see or do while in San Francisco? Toby Laing (TL): We’re only in town for like 40 hours so we’ll keep it simple. Buy some records from Amoeba and find a great restaurant . . .
(SFC): For your first album you had twice as much time. Did you ever feel rushed in your process for this album? Why was this album faster? Why is it important for you to remain independent? (TL): Being an independent group allows us to take some time when we work in the studio. We took two years to record Dr. Boondigga & The Big BW. Most of our songs originate as improvised pieces and it seems to take a while to translate them into recordings. That’s our process really – developing songs live and then finding a way to capture them . . .
(SFC): What does it mean for you to now be able to tour in the US? (TL): It will be cool to visit San Francisco! We’ve been touring the last four years over to Europe, the U.K., Australia and around New Zealand. We are looking forward to checking some new cities and absorb some musical culture. (SFC): With your first album, an interviewer asked you, “what do you think is your greatest achievement as a group?” The response was “finishing this album” Now, what do you think your greatest achievement as group has been so far? (TL): That’s a difficult question to answer . . . I’m proud that we have kept the group together and continued to develop our music. After almost ten years there’s some great history to look back on. I remember playing the Jazz/ World Stage at Glastonbury. That was probably our largest audience. Also winning the people’s choice at the BBC Worldwide awards was a great honor. And then there was the Movement Festival in Detroit – crazy cool. (SFC): Do you or the band have any rituals in preparation for a show? (TL): Well the show itself is a bit of a ritualistic soul séance so beforehand we like to stay grounded in reality as much as possible. Lately DJ Fitchie has been creating an alternate dimension on stage with scientific sound design. (TL): Dr. Boondigga is a sinister character that we concocted while working on the album. He is our mean spirited arch nemesis. He will stop at nothing to hinder us. BW is his unique brain washing robot, his malign butler if you will . . .
(SFC): On the new album there are undertones of techno, maybe even drum & bass on tracks like “Shiverman.” This is very new compared to Based on a True Story. What other things might we might see from FFD in the future? (TL): I think that there are ‘overtones’ of techno! 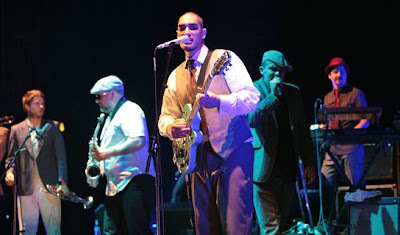 Techno is one of the musical influences that everyone in Fat Freddy’s shares. I’m not saying I listen much at home, but that was the flavor back in the early 90s when we all got interested in underground music. I hope Fat Freddy’s music continues to add new influences as we go on. Maybe we got a double techno exposure from spending many weeks in Berlin . . .
(SFC): When you’re making a first impression in a new venue, in a new location (Holland, US, Spain etc. ), do you change your set? Are you more restricting of your jam improvisation, as compared to when you’re playing somewhere in Wellington? (TL): We always write our set list fresh every time, whatever is going to be right for the gig. We still improvise the songs wherever we’re playing. (SFC): With your growing success (Dr. Boondigga and the Big BW going double platinum, you’re nominations and awards), I imagine you’re becoming a recognizable face. Does it ever feel strange traveling abroad where you’re fame is still growing? (TL): I never get recognized for being from Fat Freddy’s Drop. Wellington is such a small place and I’ve lived there all my life. Everyone recognizes me from shopping at the supermarket or because I owe them 20 bucks. 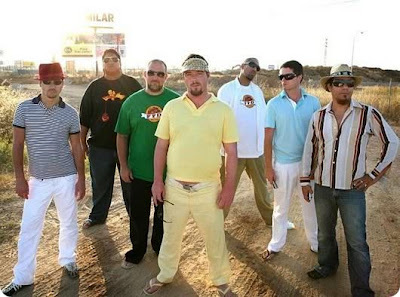 Fat Freddy’s drop will be playing a sold out show at the Independent in San Francisco on Nov. 19th. Find out more at SF Station.